Last weekend I shot sports (The Arena Grand Prix swim event in Santa Clara, an Oakland A’s versus Boston Red Sox baseball game, and a field hockey game). And I shot most of the three events with a Canon 1Dx. I’m sure that last line sent a shiver through a lot of spines. Relax. Let me describe why I did what I did. First, let me introduce some players: Canon Live Learning workshops and photographer Peter Read Miller. Peter is a long-time Sports Illustrated photographer. I’ve taken workshops with Peter before, and he’s the real deal. A pro who knows what he’s doing, and one that imparts large chunks of his knowledge to others via his teaching. I’ll try to give some examples of that later in the article, but let’s just say that if you’ve ever picked up an issue of Sports Illustrated or paid close attention to sports photographs, you’ve almost certainly seen Peter’s work. Peter has for several years taught week-long sports workshops in Denver, but has now expanded those offerings to an Atlanta version of the workshop, and this past week a three-day version offered through Canon Live Learning Destination Workshops. I can highly recommend Peter’s workshops if you’re trying to get better at shooting sports, even if you aren’t at the pro level yet. Which brings me to why I signed up for last week’s workshop in the SF Bay Area (where I was born and raised, by the way): every now and again I like to do an extended shoot with Canon gear. This weekend workshop provided that. Along with Peter, Canon Live Learning provided two additional personnel to help with understanding and mastering the cameras. Shooting with Canon gear from time to time helps me assess where the Nikon product is in relation, and sometimes even gives indications of what might be next, as both Canon and Nikon often look at each other’s offerings to add features and plug gaps. Here’s the thing: to rent a 1Dx, a large variety of Canon lenses, and then shoot with them long enough to get comfortable and be able to truly assess them would cost a fair amount of money doing it on my own. Plus, of course, I’d have to arrange some things to shoot while the gear was in my possession. Or, I could just enroll in the Canon Live Learning sports workshop and borrow a 1Dx and the lenses I wanted to try. Canon brought 18 1Dx’s for 15 students to the workshop, plus had plenty of the exotic lenses to go around. I borrowed a 1Dx, the 70-200mm f/2.8, and the 200-400mm f/4, plus I also shot with the 400mm f/2.8 and 4.0 DO at various points, as well. Besides the access to gear, getting useful pointers from Peter plus credentials for several interesting sporting events was just icing on the cake. Note: I was also shooting with my D4, 70-200mm, 200mm, and 400mm lenses. So that explains where I was and why I was doing it with a Canon DSLR. Let’s get to the shooting itself. 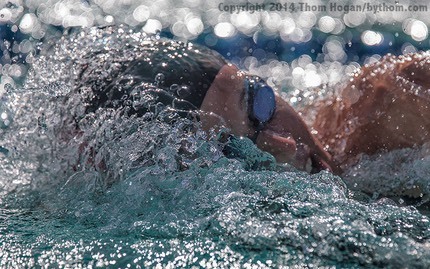 After an evening of getting basic pointers from Peter and a talk through the major settings on the camera by Canon representative Eric Stoner, we headed out the first morning to shoot the preliminaries of the Arena Grand Prix swim event at the Santa Clara Swim Center. Amongst the many top swimmers present were Olympians Missy Franklin and Michael Phelps. As you might be able to tell from the two photos I’ve shown so far, we had full access to the deck, just like the pros working the event for publication who were on deadline. And the photo just above brings me to one of the fine points that Peter was pointing out to us along the way: freestyle is a tough event to get good shots of. 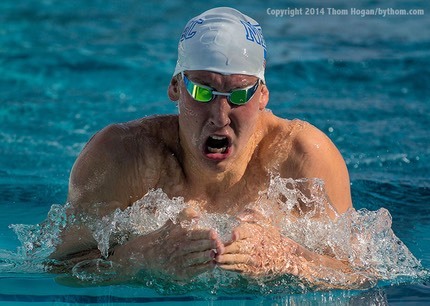 Your best position is down low and just behind the swimmer as their hand comes up out of the water. If you’re lucky, you’ll get a good view of the face as they come up on their breathing cycle. Of course, that’s if they’re breathing in your direction. Some swimmers always breath on one side, others alternate, and we had one example where the two swimmers in the middle lanes were breathing on the side facing each other so they could better assess their position vis-a-vis one another. So to be in the right position, you also have to have an idea of what the swimmer is going to do in terms of breathing (though it may change). I was watching a few key swimmers I wanted to cover in the preliminaries. Most of them did the same thing in the finals, though a couple didn’t. Oh, and how do you tell which swimmer is which and which event you’re shooting when you’re looking at your files afterward? Shoot the scoreboard with the event name prior to the event, then shoot the lane markers of the swimmer(s) you’re shooting in that event. With those two pieces of information, you can just consult the full schedule of events/swimmers given to the media and figure out whose head that is sticking partway out of the water. While I know most of whom I shot during the event by sight, this little tip helps me identify the others I shot. You might notice in the images that there’s often a ton of water bouncing up in front of the swimmer’s faces. What you have to deal with is trying to keep the camera focusing on the face, not the water, and that means that you’re going to be looking closely at the tracking settings and focus position you’re using. Which brings me to my first comment about the 1Dx: I was able to quickly dial in a focus setting that didn’t jitter the focus every time water splashed up in front of the swimmer. To some degree, I found the Canon 1Dx less jittery in that respect than my Nikon D4 with my usual settings. On the other hand, I was more comfortable with moving the focus position on my Nikon, and it was faster to change to a different focus mode setting while still shooting with the D4. From the preliminaries of the swim meet we went to the Oakland Coliseum to cover the Oakland Athletics taking on the Boston Red Sox. The photo above is taken with my V3 and shows the outside third base shooting position. There are three other positions between here and the coveted first base position where the photographers on deadline usually work. With 16 of us in the workshop plus the four photographers working the game for publication, we pretty much filled the available on field shooting areas. Between innings we could move between positions if we wanted to. For this event I was shooting mostly with the Canon 200-400mm f/4, which has a very handy built-in teleconverter you can flip into place. I have to say, that lens is deadly sharp based upon my shooting. Even though I’m at f/4 and my focus is slightly off the bag itself (I was focusing on the second baseman here), the small souvenir print on the bag cover is still very readable (and for sale later in the souvenir shop, as they change these covers every few innings ;~). Basically, if the focus was on, this lens was popping detail. Had my shutter speed been fast enough to stop the ball we would be seeing the seams and the MLB logo pretty sharp, too, even though my focus plane is on the batter’s body (very close to his right hand in this shot). Yeah, I don’t know what’s going on with those eyes, either. One thing I did notice during the evening was that the 1Dx was getting to first focus just a teeny bit faster than the Nikon. Not enough to get excited about, though. Indeed, most of my experience both this time with the 1Dx and D4 and previously with other 1D versus D3 and 5D versus D700 shoots I’ve tried is that if you look hard enough you can find small things that are slightly better with one camera brand or the other. Thing is, they all tend to even out. The Nikon seemed a little faster to leave the original target and find a new one when focus needed to be moved, the Canon a little faster to find the first target. And please note the words “a little.” I really mean a little. I had to try a couple of experiments several times to become convinced that I was actually seeing a difference, that’s how small the differences I’m talking about are. Moreover, both cameras have very complicated and extensive systems for modifying their behavior. I’m not sure that in three days I was able to fully extract everything the Canon focus system has to offer. Suffice it to say I could live with either focus system, and there really isn’t anything in lower level cameras that comes close to matching the top end Canon/Nikon focus systems at the moment. After almost no night’s rest it was off in the morning to another event, a practice game staged for us by the Los Gatos High School field hockey team. I definitely have to thank the ladies for doing that for us. They played a complete game and they played it very hard. You might not be able to tell from the small images on this site, but as photographers we were dealing with heat waves coming up off the grass, so this wasn’t just a quick romp in the park for anyone. Both the players and the photographers were sweating by the end. Some of Peter’s pointers for field hockey proved to be a lot more difficult to put into practice than one would think. 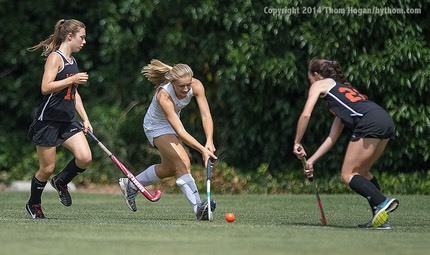 For example, did you notice how this last photo was a little more engaging than the previous one, and that was more engaging than the first field hockey image I posted? It’s all about seeing the face. I’m down lower and the player is looking up. That’s where Peter’s decades of knowledge from shooting sports really shows up. I’ve worked with him on eight different sports now, and he’s got great pointers for all of them. Of course, the lower on the field we shot, the more the heat waves became a problem. So sometimes you have to compromise something. After field hockey, it was a short break before heading back to the swim meet for the finals. Every stroke poses a different problem to photograph, so you tend to move around quite a bit during the course of a meet as different events come up, especially when key swimmers are ending up in different lanes. We had one quick jump where Missy Franklin was in lane 6 which was in shadow, and then in the next event Michael Phelps was in lane 3 in sun. Not only was the lighting different, but the lanes were on opposite sides of the pool, so you had to consider your shooting position very carefully. As it turned out, I missed Phelps because the combination of backlight and his breathing direction just didn’t lead to a decent shot from where I ended up. Peter was emphasizing those things over and over as he roamed around watching us shoot. He’d make suggestions for improving our position slightly and increasing our chance of getting a better shot. Since I don’t shoot sports much these days, I’ll take every bit of that advice and try to put it into practice when I can. That said, everyone’s real question of the moment probably is this: am I switching? Is the 1Dx better than a D4? What did I like on the Canon? Okay, a few answers, but remember they’re based upon a high concentration of shooting over the course of a couple of days only. I reserve the right to change my mind ;~). First things first: the problem with Adobe converters on Nikon raw files is even more obvious to me now. It’s a bit like ACR was tuned to the 1Dx and the D4 wasn’t. Running Canon raw files through Photoshop was a pretty painless process. Color was good, linearity was about right and didn’t need wild swings or changes of contrast in the shadows or highlights, and files looked pretty good just at the defaults. With Nikon NEFs, there’s just something not quite right about Adobe’s conversion. Color can be off (I regularly dial back orange in ACR conversions), the linearity is different than optimal, and I often spend a fair amount of time tweaking settings with more major swings than I was using on the Canon files. This reminds me a lot of working with Fujifilm and Kodak films. There’s just a different interpretation of color going on underneath. I’m not sure the Canon bits are any better than the Nikon bits, but when Adobe gets hold of them I see major differences quickly. Amongst the Nikon faithful there’s been a long-held belief that Capture NX2 dials in NEFs better and easier than ACR, and that's mostly true. Frankly, this is hurting Nikon, not helping them, especially now with the changes they’ve made to Capture, which mean virtually all of us no longer want to use it. Nikon needs to share their color and linearity models with Adobe and encourage Adobe to match them properly. Simple as that. I know Nikon has a burr in their behind about Adobe for some reason (dating to relationships between them in the old film scanner days), but they need to get over that and realize that most photographs are going through an Adobe workflow these days, and if that workflow is suboptimal for Nikon images, then Nikon cameras just don’t look as good. You’d think they’d want photos from Nikon cameras to look the best, but that’s not what’s happening today. In terms of features and technologies, I’m not sure there’s much to distinguish between the 1Dx and D4s these days. Canon has adopted color-aware light metering, for instance, and pretty much everywhere I look I can see things that the Nikon gained by imitating Canon and vice versa. Suffice it to say that if neither of these cameras have the features you need, then probably no camera does. Where the differences show up the most is in handling. Nikon’s button+dial interface is optimized to keep the eye at the viewfinder and the first finger on the shutter release. Yes, I can and do set AF settings with my eye at the viewfinder and my finger on the shutter release. Because of that, I have a very fast snap reaction when shooting action. Canon’s buttons and dials really require you to take your finger off the shutter release. I was pleased that I could distinguish the first top button (ISO) by feel, which is a change from the last Canon pro camera I used extensively. Since I wasn’t changing too many settings nor very often, I felt completely comfortable in changing what I needed to when I needed to without dropping into the menus, with perhaps the one exception being autofocus nuances. I’m sure I could have programmed some of those into buttons to access directly, but I didn’t have time to explore that. No big deal, I left the camera on the first focus settings menu, where most of the things I wanted to fiddle with live. Still, this is something I want to explore more the next time I shoot with a 1Dx: I”m not sure how much I can get out of the menus to where I can access it while shooting without taking my eye from the finder. On the other hand, I’m not what I’d call a very nervous shooter. I don’t change settings all that often. So I was perfectly comfortable shooting with the 1Dx for two days. That said, the hand positions and the control positions of Canon and Nikon are completely different. Some folk will prefer one over the other, while others will have the opposite likes. There’s really no point in getting too embroiled in debate about this: we can’t have it all ways. Good photographers will adapt to their tools, at least as long as those tools deliver. And the 1Dx did deliver. I never felt held back by the camera. Focus was quick and sure. As I noted above, there was less a tendency to jitter off the focus plane I had selected because of small things like water drops splashing up, though sometimes the 1Dx would lock onto to those. Also, the metering was far more consistent than that of the 5D I used to own. Many of the quibbles I had about Canon the last time I fully reviewed one of their cameras have disappeared. Good on them. But what I really liked was the 200-400mm f/4 lens. As I noted above, it’s sharp. It’s a little heavier than the Nikon and much more expensive, but I didn’t see any issues at long distances like I do with the Nikon (though the Nikon is also incredibly sharp at distances shorter than 50m), and having that flip-in 1.4x TC makes it more versatile. I was shooting the baseball game at night and getting by just fine, so the f/4 maximum aperture really wasn’t holding me back. Every now and again I missed f/2.8 for depth of field isolation, and that’s about it for complaints. The lens handles very well. The bigger problem I had was keeping focus on the face and not having it pull out to the water in front of the face (bottom shot). The contrast issues I saw were modest and mostly resolvable in post processing. Still, I was impressed with its focus performance and sharpness. If I were a Canon shooter I’d seriously have to consider such a lens for Africa, as it’s small and light to travel with. I’ll probably dip into another session shooting Canon gear as soon as I can to try to firm up some of my impressions and try some additional gear. But my sense of things these days is that arguing between Canon/Nikon is still the same as arguing Chevy versus Ford or iOS versus Android or any of the many dichotomies that exist these days. You’ll get into the minutia very quickly, and for no gain. Most folk would be better served by paying more attention to what they’re doing with the equipment than the equipment itself. Which brings me back to Peter Read Miller. Seriously, if you’re trying to become a better sports shooter, he can help you. I learn things every time I’ve been with him. Peter’s next sports workshop is scheduled for Atlanta from October 6-12, 2014. His next Denver workshop will be in April 2015, though the dates won’t lock down until November. To see Peter's workshop schedule, click here. To get on his email list for workshops, click here. To see the upcoming Canon Live Learning schedule of destination workshops with pro photographers, click here. Disclosure: I paid all costs and expenses on this trip, and it was my idea to do it. So any of you that think that I wrote something positive about Canon products because I got some sort of consideration from Canon would be wrong.